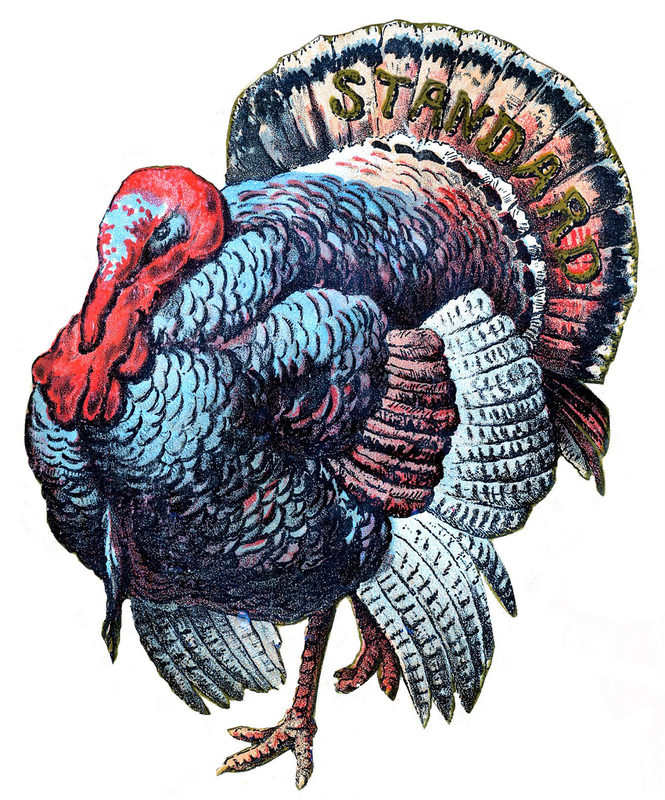 This is a collection of 7 fabulous Vintage Thanksgiving Turkey Images. These wonderful Turkeys are mostly Natural History Images scanned from my collection. 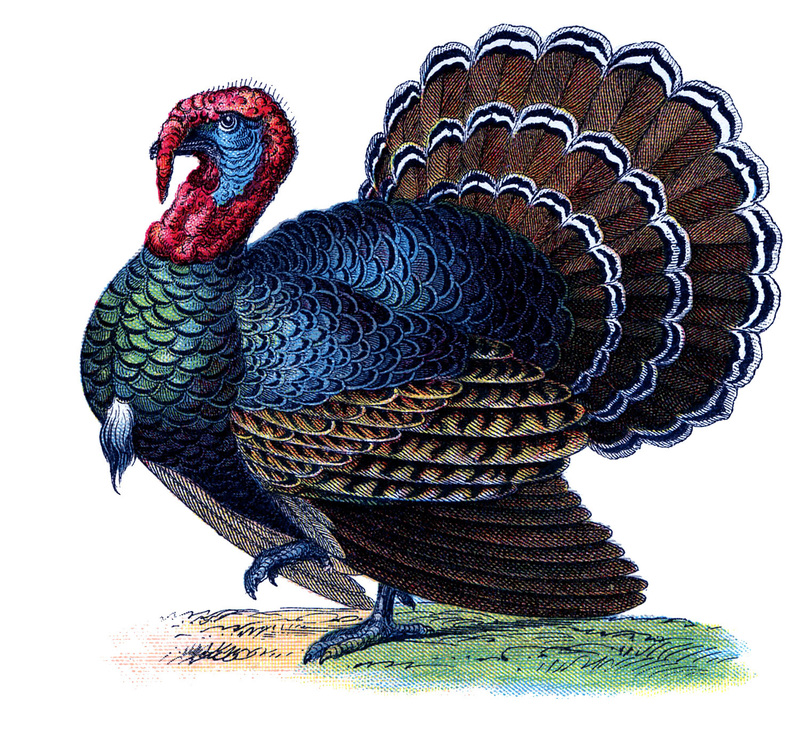 There is a mix of full color Turkeys as well as a couple of black and white engravings. Some of these guys have their tall feathers up in full fan position and some have them down. These would be great to use in your Thanksgiving Craft or Decor projects or perhaps you can use them on your Holiday Invitations, Place cards or Menus! 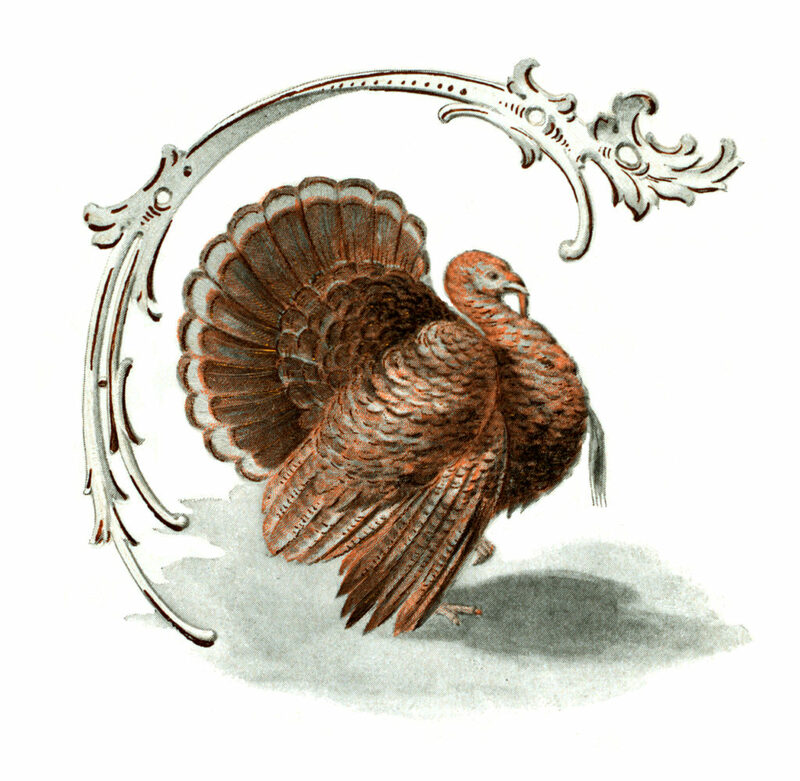 This lovely Thanksgiving Turkey Image, was scanned from a Circa 1850 print that I purchased from an Antique Dealer in France. He has beautiful coloring, he has a red head, brown feathers along with some very pretty glue and green feathers on his wing. His tail is down, but he’s still quite attractive. This is a brand new image to the site! 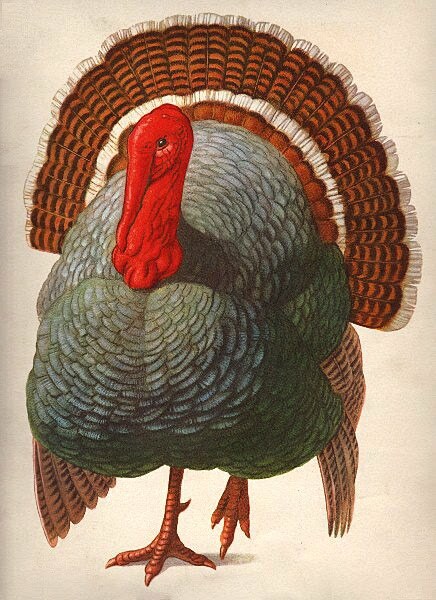 Here’s a beautiful Turkey Image for your Thanksgiving Projects. 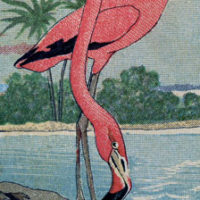 This one comes from an Antique Children’s Encyclopedia. I think the detail is incredible on this one! I first scanned this quite a few years ago and he’s still one of my favorites today. He has lots of beautiful colors, red, blues, greens and browns and his tail is fully fanned out. I love the black and white trim on the edge of each of his tail feathers. This big beautiful Turkey image comes from my Great Grandmother’s Antique scrap book, from the late 1800s. It looks like this was an old advertising card that she cut out. It has the word “Standard” on it’s tail. I’m afraid I don’t know what the product was that this was supposed to be advertising, but I think he’s a lovely fat Turkey. 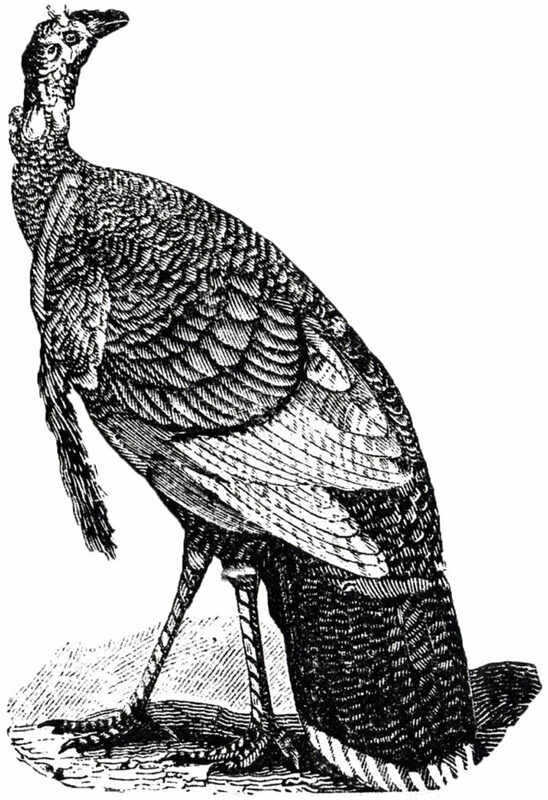 Next we have this Public Domain Turkey Image! 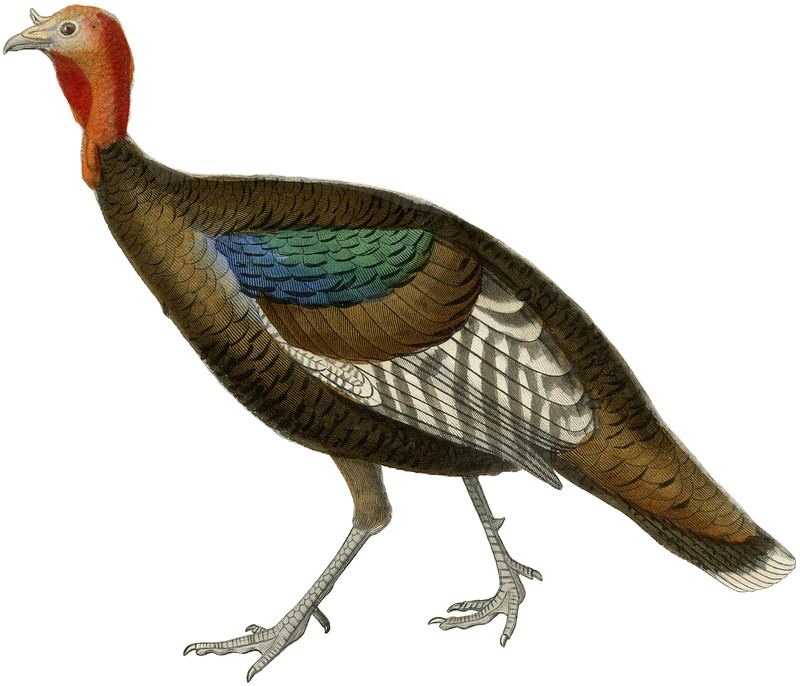 Shown above is a lovely Brown Turkey with a Fanned Tail and a pretty Decorative Scroll around him. He seems quite proud to have such a fancy embellishment framing him up! I absolutely adore this fat beautiful Turkey! I scanned this one back during the early days of my blog, and unfortunately he is rather a tiny image. I borrowed him from a friend and my friend believes that she still has the original so there is still hope on this one. She has yet to locate it, but once she does she has promised to re-scan him for me at a larger site. You might also like a quick and easy Thanksgiving Napkin Ring project Tutorial using this guy HERE, there is also a printable that you might find useful. 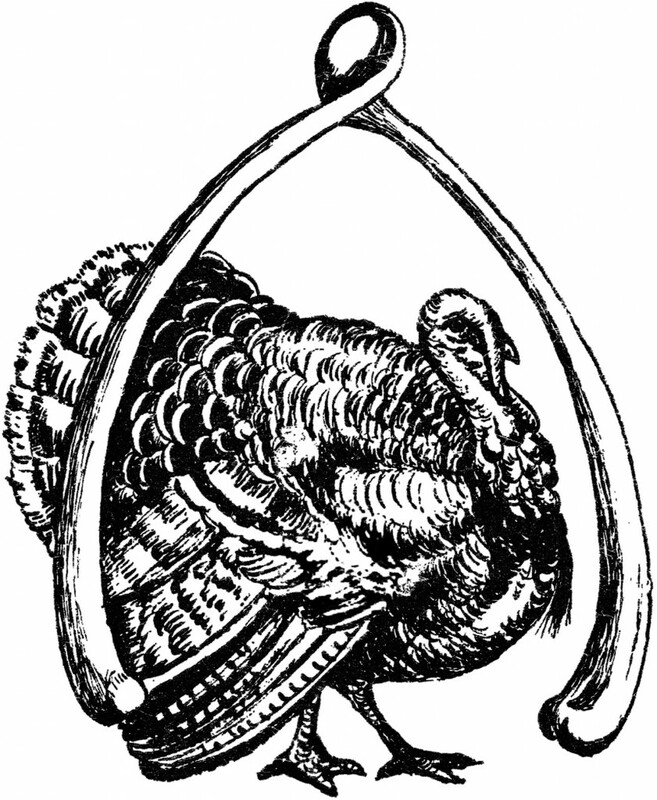 This Turkey Engraving was scanned from an Antique Circa 1828 Printer’s book. This image has loads of details and is very well done, however I think this poor Turkey is a bit homely looking! He may work well in Primitive projects though. And lastly we have this Thanksgiving Turkey Wishbone Image! This is a black and white illustration of a Beautiful Turkey walking under a giant Wish Bone! 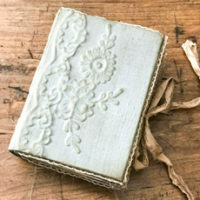 This one was scanned from a Circa 1920’s Vintage Booklet. 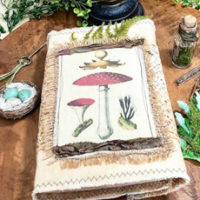 A fun little image to use in your Art or crafts! I hope you enjoyed this mix of Thanksgiving Turkey Images and that you can find a use for some of these in your projects. « 3 Christmas Tree Printable Art – Glorious Giant Botanical Trees! WoW! That is a beauty! OMG!!!! This is my 1st visit to your site & I am in LOVE!!!!! I became a follower & a subscriber…I can’t wait to have the time to look back through your older posts! Thanks for sharing!! He’s stunning! Thanks so much! What a beautiful turkey! Thank you so much. ScrappyMama, Welcome!! Thanks for following! Magnificent Bird!! Best I’ve ever seen! Thank you for all you do Karen!! Really beautiful turkey—a real keeper! Thanks Karen! I love receiving your emails! I download the images religiously & simply look at them from time to time wondering what, if anything, I will ever do with them. Just having them makes me happy! This turkey way too beautiful to have as dinner. Thanks for sharing him with us. Karen I love your site!!! I’m a subscriber now and you can bet that after the holidays I will be visiting your store. Your images are the best ever. I love your holiday retro images. Thank you so much! I like all of these, thank you very much!